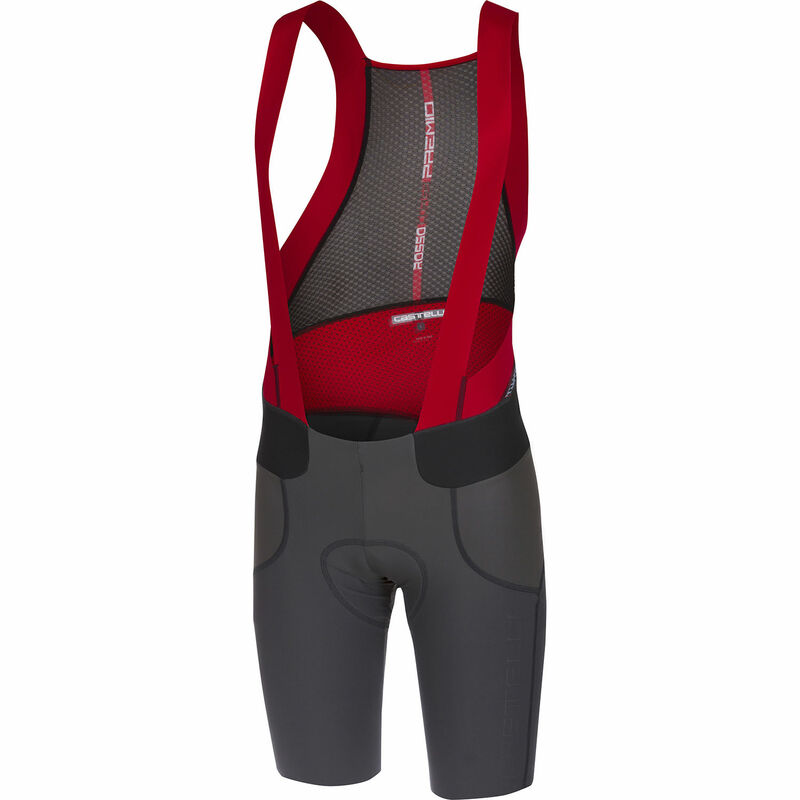 The Castelli Premio cycling bibshort provides extra support and comfort for your longest days in the saddle. Featuring Castelli’s Forza fabric which gives notable muscle support and compression helping to keep you feeling less fatigued and fresher for longer includes a mesh compression support band for your lower lumbar area to help prevent lower back pain on those all-day epics. With reduced seaming for enhanced comfort and raw edge leg cuffs with silicone grippers that keep the Premio legs in position without applying any pressure or cut into your legs you’ll be happy to wear these bibshorts for hours at a time. Great fit, wonderful fabrics, all day comfort, long lasting quality!! Great customer service as always from Merlin!! I have doubt when I put an order for this bib considering the mix review , particularly on the short strap. I usually wear L size castelli bibshort but based on the feedback, I ordered XL. I was skeptic when I took the bib out from the bag but when I tried it on, it fits me well. I have to point out that I am 6.2 but I have long legs so this bib fits me well . I hope this bib up to the expectation when I wear it for my long ride this weekend. I hope this review helps. These are one of my first pair of Castelli bibshorts, I bought these along with a pair of Castelli Velocissimo IV, and wore them both for the first time this week on my commute to work. Firstly, I am glad I took the advice of other reviewers and did not trust the size chart. I am 187cm, 90kgs with a 33 inch waist, I went for the XL and they fit well. The straps are a little tight to start when standing, but fit well when in a riding position. The pad is comfortable, but it sits a few centimetres to far back that results in it not having the optimal contact with the saddle. I really like the seamless straps and the wide back. Overall they are really comfortable and feel well made. Time will tell how they hold up in terms of comfort and quality, but so far I am happy with my first Castelli experience. Awesome bibs. By far the nicest I`ve owned. Im 6`1" and weigh 185 pounds and XL fits me just fine. Supremely comfortable, replacing my 5 year old Assos S5 Mille. Chamois padding is good, and not as bulky. Compression is good, and whilst the lower back compression seemed like a gimmick, it does make a difference - so much so I ordered another 2 pairs. Recommend going up a size in these. I usually wear a medium and they were seriously tight. Excellent quality bibs. Great service from the site. I've been biking for fitness for over 43 years. Recently I started having problems with small saddle sores. Not since I started riding with Premio Bibs. These are the most comfortable bibs I have ever worn. I am 6 feet tall and weigh 164 pounds. I usually wear mediums , but because of the reviews I upsized to large, Perfect! With Merlin's sell price it was a great buy. These are the second pair I have purchased. Thanks, Merlin! Top quality shorts as everyone would tell you. I ordered a medium and large since this is my first time with castelli and most people recommend sizing up. I'm 172cm tall with a 37-38in chest and 32in waist (approx depending on time of year) I could get the medium on but they were very very snug and pushed up the little belly fat I have which I could feel when leant over in a cycling position. However they gave good compression, which I like, but with the straps a bit tight over the shoulders I then tried the large. The large size, which I kept, were a bit more relaxed but still fell nice on, still grip on the legs and bum, no slack bits or bunching, there is a bit more room around the middle so my paunch stays where it is and the straps, whilst still snug do not dib into my shoulders. The quality is there, I'm not sure if I'm an 'easy' castelli fit, but I got these on offer and being top of the range bibs I'm hoping they last, they certainly look great. Being 195 cm tall and of normal build the size of the short (2XL) is good but the bibstraps are nearly uncomfortably short. Looking at Castellis sizing guide I think that 3XL shorts would be to big for me and at the same time not know how much longer the bibstraps are. Pure luxury with amazing fabrics and super price from Merlin. Progetto X2 Air seat pad is all that needs to said, but for new comers castelli's cut is great and holds you in all the right places, worth the dollars/pounds. Ordered small as suggested by the size chart (78 cm waist and 94 cm hips) and the fit is tight but not constrictive. Comfortable pad and very nice material in the bib straps. Excellent shorts for long days in the saddle. I like them so much I bought a second pair! I bought these shorts for endurance training for our Ventoux and Alps adventures this year. They are fabulous; snug fit, comfortable pad and good compression on the legs. Excellent for long days in the saddle. These are now my favourite shorts. Have normally used a Swiss make of shorts but these are far superior in comfort. Very faint logos keep things looking classy. Price is understandable once you have worn them.